I was hoping to write a couple of happy stories this week about the Metro Orange Line. 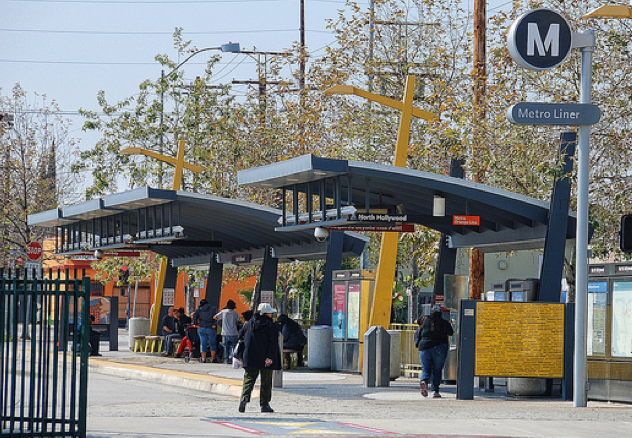 The San Fernando Valley’s highly-regarded workhorse Bus Rapid Transit (BRT) opened in 2005. Lately, a new pedestrian tunnel and faster bus speeds seemed imminent. These facilities would save time for the Orange Line’s 30,000 daily riders. Earlier this week, I reported that the tunnel, which I like, but L.A. Times architecture critic Christopher Hawthorne does not, is under construction. The construction site is not so friendly for pedestrians. Also, per Metro’s clarification, the heavily-used surface crosswalk across Lankershim Boulevard is being moved to a less convenient location. The crosswalk was at the south side of Chandler Boulevard North; in the future (and during construction, now) it will be on the north side of Chandler North. This means pedestrians will need to cross Lankershim and Chandler North, instead of just Lankershim. Perhaps, in front of the Metro station, pedestrian prioritization is called for. Perhaps include crosswalks at all the legs of the intersection? Maybe a pedestrian scramble? But that’s another story. Today, I am disappointed to report that the bus speed improvements that appeared to be imminent seem instead to have fallen into a limbo of inter-agency delay between Metro and the Los Angeles City Transportation Department (LADOT). The Orange Line BRT runs on its own busway: basically a bus-only street built on former railroad right-of-way. The busway runs generally east-west and, at signalized intersections, crosses numerous north-south streets. In its first few months of operation, the Orange Line ran faster than it does today. There were a handful of car-bus collisions on the route, reportedly due to drivers failing to obey traffic signals. The excuse that has been repeated is that the drivers were not used to seeing any traffic on that long-abandoned right-of-way. After these collisions, Orange Line bus speeds were reduced. Today Orange Line buses slow to 10 mph when crossing intersections. Now that, at least, local drivers are more aware of the presence of Orange Line buses, there is movement afoot to improve the Orange Line by bringing its buses back up to speed. As both the Los Angeles City Councilmember representing neighborhoods along the Orange Line and a Metro Boardmember, Paul Krekorian is uniquely situated to champion Metro Orange Line improvements. With Council colleague Bob Blumenfeld, Krekorian authored council motion 14-1352 [PDF], which instructs LADOT to work with Metro to figure out how to improve Orange Line service, including increasing speeds. Los Angeles City Councilmember Paul Krekorian: Well, maybe we can make this very easy then. Is it the city’s position that Metro can unilaterally change the speeds at intersection crossing points on the Orange Line without approval of the city? Bill Shao, Senior Transportation Engineer, LADOT: Yes, it is. Shao: We – the city – we have to understand what the new speeds at crossings are so that we can align our signals to their needs. Krekorian: Which actually becomes a bigger issue but that’s an issue that can happen after these changes take place. For many years, LADOT resisted increasing speeds on the Metro Orange Line BRT, as it would mean that some people in cars will sometimes experience minor delays in crossing the Orange Line. Shao’s October testimony was the first clear message that LADOT is fully on board, and now the ball is in Metro’s court to improve Orange Line speeds. My hunch is that this change can be attributed to Seleta Reynolds’ leadership. At the October committee meeting, Metro Interim Executive Officer Jon Hillmer said that Metro was planning to increase Orange Line bus intersection speeds from 10 mph to 25 mph, which Metro expects will save cross-Valley commuters 4-8 minutes per trip. The next day, I reported that Metro Orange Line speed improvements appeared to be coming soon. According to the staff report [PDF], LADOT had considered applying for Metro Call for Projects funding to help Orange Line buses communicate with LADOT traffic control systems, but that project did not make the cut-off on LADOT’s final go-ahead list approved by City Council earlier this week. At the October meeting and in that Call for Projects staff report, an inter-agency Memorandum of Understanding (MOU) was mentioned. LADOT’s Backstrom clarified that speed improvements will follow at some point after Metro, LADOT, and the City Attorney agree on an MOU. Backstrom couldn’t give me any details on what would be in the MOU or when it might be expected to be completed. I expect that we may need more of Krekorian’s and Reynolds’ leadership to get the MOU done before the new tunnel opens in 2016. Right after the Orange Line opened 9 years ago, scofflaw drivers ran red lights and collided with Orange Line buses. Metro and LADOT quickly responded to reduce bus speeds. The agencies didn’t sign any memoranda, didn’t engage in any studies, and didn’t seek any outside funding. Just as with speed limit increases, pro-car bias makes it a whole lot easier to speed cars up, and difficult to cut against that grain in favor of transit, safety, and complete streets. Now that there is a consensus in favor of speeding up those buses — a low-cost measure that would mean dramatic improvements in the lives of transit riders — both agencies are waiting. And so are the passengers on crowded buses traveling more slowly than necessary across the Valley. The much higher cost of building a light-rail or a heavy rail line compared to a BRT greatly limits the amount of train lines that can be built compared to BRT for a given amount of money. If the passenger load along a corridor can be handled by a BRT, then choosing BRT over rail in that situation increases the ability to built more major transit lines whether that is rail or BRT. An example of how this works is the upcoming East San Fernando Valley Transit Corridor Project. This 9.7 mile proposed project has light-rail estimated to cost $2.7 billion and carry 47,400 passengers a day. The median running BRT alternative would cost an estimated $402 million and carry 31,500 passengers a day. Train enthusiasts like yourself will probably automatically say that its quite obviously this has to be light-rail because it can carry 47,400 passengers a day. But, another consideration is that for $2.7 billion there could be 6.7 BRT lines built that will carry a total of 211,567 passengers a day if each line carried as many as this BRT. These BRT lines built with $2.7 billion would then carry far more passengers than light-rail. There also has to be the consideration of how much money is available to build a transit line. In the case of the ESFV Transit Corridor Project $2.7 billion is out of the question. Metro only has $170 million set-aside for this project and the federal government has already told the project team that they are not interested in paying enough money to cover the rest of the cost to get this built. That essentially means it can’t be built as light-rail. I’m dealing with the reality that there is a finite amount of money to build these projects and how do we increase the service for the most amount of people given this restraint. You and other train enthusiasts seem to lose sight of the fact that there isn’t an unlimited amount of money available and that the more expensive the project, the less of them that can be built. You have some bizarre ideas about the world. Zev did not put the Orange Line corridor into a corner in that it had to be BRT. Metro was going to build a light-rail line along the alignment until the Orthodox Jewish community got their state representative to create a bill banning surface rail. The Orthodox Jewish community thought they had effectively banned any transit from being built along this corridor. Zev found a way around this by suggesting that a BRT like the one in Curitiba should be built. Metro was not going to extend the Red Line heavy rail in a tunnel along this alignment. This corridor is mostly a non transit dependent low population density area that does not justify this cost. Banning any more subways had no affect on building transit along the Orange Line corridor since Metro had no intention of doing that. Metro also wasn’t wasn’t going to put a third-rail electrified subway train on the surface without elevating it the entire length and that would also be cost prohibitive, let alone an unacceptable eyesore for the owners of houses along the alignment. If it wasn’t for the BRT there wouldn’t be a significant improvement in transit along the Orange Line corridor. Light-rail was banned by law and a heavy rail tunnel was too expensive. The Orange Line has been a huge success. Its the busiest Metro bus line in the San Fernando Valley. Some of the people who ride it were previously driving. Twenty-one thousand more people were taking transit along this corridor two years after the Orange Line opened, which is a 51% increase in ridership in two years. That is an increase in mobility and it has been happening for almost ten years. You seem to want to deny those people a service improvement just because its not rail. That would be foolish period and a great example of being fixated on a technology rather than on increasing the level of transit service. The Blue Line has not attracted developers. This is an example which shows that rail does not inherently attract development. The Orange Line has had development along its corridor since BRT went into service. The Blue Line maxed out in capacity shortly after it first opened. The stations had to be extended to accommodate longer trains. Obviously, in your eyes it was a huge failure because of reaching capacity. Oh wait, its rail, so even though it reached capacity like the Orange Line it was a huge success in your eyes and the Orange Line was a failure just because it uses buses. Just like the Blue Line, the Orange Line BRT needs some adjustments to increase its capacity during peak hours. Its capable of handling thousands more passengers per day without a large investment. Rail construction costs aren’t “demonized.” If Metro can’t obtain the money to build rail then what are they supposed to do, nothing? Your still of the belief that Metro is somehow printing billion dollar bills in a room somewhere. I have no idea how Gil Cedillo relates to any of this. Most transit users don’t care whether what they are using is a bus or train. They want fast, reliable and frequent service. The Orange Line was obviously a significant improvement for them and has proven to attract much more ridership than the previous service. Dennis, Please get a copy of both Elkind’s book and Charles P. Hobbs newly published “Hidden History of Transportation in Los Angeles” and read them. Thanks. Yes and No because the design of the busway as it was built limits what operational improvements can be made. This is a missing part of the conversation. Busways can be theoretically built to such high frequency and demand, this one was not. Even if speeds through the streets increased you’re increasing some ridership and reduce a few bus runs you immediately run back to the capacity issue with each upgrade you make. These are only stop gap solutions, you either have to do it all at one time or you just upgrade to the next thing. Off the top of my head the only infrastructure upgrade that would help in the near term and can last for a good amount of time is building a short line turnaround loop for the Orange Line so that you can max out the peak demand of the corridor and have the buses only run between NoHo and that point (probably Sepulveda or Van Nuys). However there needs to be a spot where Metro can actually BUILD this turnaround loop with the proper amount of pavement reinforcement to hold the heavy high capacity buses. As a side note towards Long Range Planning, strategically knowing that you’re building an addition line such as the Sepulveda Pass that is perpendicular to the Orange Line which will significantly increase demand on the Orange Line, like the Red Line through the Caheunga Pass it is better to think about the conversion now rather than wait until you’re desperately over capacity to build the real improvement that is needed given how long it takes to plan and get it funded. Legislation will need to be passed to enable the buses to be operated outside of the guideway and on to city streets for such things as getting buses to the yard after their run OR needing to detour off of the busway for an emergency. Currently per CA code or law, the maximum vehicle length is 60 feet due to the axle weights damaging the pavement. The buses could also have less seats to increase capacity. There are 57 seats on the Orange Line 60-foot NABI buses. Several bus manufacturers offer an option of 29 to 31 seats on 60-foot buses. This would increase passenger capacity on the buses by 40-50% by virtue of each passenger that stands taking up less floor space than those that sit. Tokyo and New York City have less seats on every subway car than there is on the LAMTA subway cars. That’s to get more people into the each rail car. Same thing can be done on buses. The carrying capacity of a 60-foot length bus has not been reached on the Orange Line. That works well during peak period with some ride quality improvements needed however for commuting long distances as currently experienced on the Orange Line, is that going to work for those using it? Off peak you’re running more buses to handle the seated capacity needed which increases operating costs. Maybe a compromise of reducing seats near the doorways is an approach that can give room while providing additional capacity and this can work for all buses all the time. With buses maximum axle weight and load weight capacity are important bits of information to ensure that the buses can safely handle the additional standee load that has been added on. This isn’t as elastic as steel wheeled rail there’s limits on what can work for the buses. The Orange Line is not a long distance Greyhound bus. Passengers get on and off. If there is not a seat available when you get on, there could be a seat available at the next few stops. I often ride the Red Line subway from Universal to the Civic Center or to Union Station and I usually don’t sit. I can’t recall when I’ve ever seen a Red subway car that didn’t have people standing around the doorways and the ride could be as long as the Orange Line bus. If a bus manufacturer lists an available option of less seats, then the bus is capable of handling the increased weight of more passengers. The Orange Line bus does not demonstrate the maximum capacity of a 60-foot bus. It does show the capacity of this particular bus when equipped with 57 seats. Also when you’re standing on that rail line compared to that bus, Do you also notice that it’s more comfortable to do that as you’re not shaking around compared to a bus? That is a factor for when luring transit as an alternative and the trip distances I’m talking about are 7+ miles in length which for the average distance of the Orange Line bus is holding on for about 20-25 minutes. If your trip is short like 5-10 minutes, like it is in NYC and Tokyo examples this is not a problem when the distances are longer to 20- 30 minutes and there’s a lot of passengers doing this travel distance, Standing the entire way makes a difference and this is part of a longer transit trip, this makes a significant impact. The Gold Line does going through Highland Park it has speed reductions at crossing and overall through that section. They do not have quad gates so you have to have a speed reduction if its at-grade without them. If a bus manufacturer states that a particular model of bus can be ordered with 30 seats or 57 seats then it is safe to assume that the bus can handle the additional passenger load. I’m not making up seating capacities that aren’t already available from transit bus manufacturers. You seem to be assuming that this cannot be done or that its a new idea and its not. When I ride the Red Line subway there is a tremendous amount of side to side movement when going around curves and sharp starts and stops. All of which can knock you off your feet if your not careful. Transit trains have little up and down motion and buses can have a noticeable bumpy ride. Then again, train cars cost about 4 times more than the 60-foot buses on the Orange Line. You should expect to get something more for that additional money. Rail cars typically last *40* years. Buses are thrown away after 12. And yes, they need to be refurbished during that period. The prices are comparable when you correct for the lifetime. meet demand. And no, there aren’t any more ways to increase capacity significantly other than putting tracks in. Actually, the cost of building a BRT line is equal to the cost of building a comparable light-rail line. For dramatic examples, look at the busways in Pittsburgh and Ottawa. The “East San Fernando Valley Transit Corridor Project” numbers are completely ficticious, based on comparing apples to orages; pretty much fraudulent. Yes, the decision should be made based on whether you need the capacity of rail. In the Orange Line area, you do. There are people parking outside the official parking lot. The Robbins bill meant that rather than building light rail, you wasted a ton of money dumping asphalt and buying buses, and you’ll have to build light rail on the same route later anyway. Geez. Dennis, LA Metro is actually required by law to convert the Orange Line to rail… or repay a large portion of the federal funds received for its initial construction. Good thing the Robbins bill has been repealed. No, there are no actual ways to improve the operation of the Orange Line other than to build it as light rail as it should have been originally. Nope. If you increase the number of standees on a bus, you have to slow the bus down, because people fall over if they’re standing at high speeds on a jerky, fishtailing bus. You can have a lot more people standing on fast trains, because trains are simply more stable. Train cars cost 4 times as much mostly because they last about 4 times as long. We’ve explained this before. Recent rail car purchases by the LA MTA cost $3.83 million apiece and a 60-foot bus used on the Orange Line cost approximately $800,000 each. If each bus is replaced every 12 years and the train car every 40 years, then there would need to be 3.3 buses purchased within the lifetime of a train car. That would be $2,666,666 for the 3.3 buses in today’s prices which is clearly less than the purchase of one train car. Train cars are refurbished within a 40 year service time. The Blue Line light-rail stations had to be upgraded to a longer length shortly after it went into service in order to meet higher than expected demand. Its now going through a billion dollar upgrade of tracks, stations and new and refurbished rail cars after only 24 years of service. The LAMTA staff recently made recommendations to increase the capacity and efficiency of the Orange Line BRT. It is possible to increase the capacity of this BRT without spending $2 billion on a conversion to rail. The suggestions involved removing some seats, increasing the service window for 4-5 minute frequency of buses, grade separation at some intersections, increasing the average speed of the buses through signal timing and increasing service in the sections of the busway with the highest demand. Buses could also skip some stations to create a more direct route. Two buses could load at the same time at the North Hollywood station with the first bus going directly to the Van Nuys station without stopping at Laurel Canyon, Valley College and the Woodman station as the second bus would. The Orange Line BRT has not reached its maximum potential capacity yet. The Orange Line BRT cost significantly less per mile than any of the light-rail lines built or currently being built in the LAMTA. The under construction Crenshaw Line light-rail line will cost over two billion dollars and is 8.5 miles long. The under construction Expo light-rail Line Phase II extension is 6.6 miles long and will cost $925 million. The 8.6 first Phase cost $930 million. The 19.7 mile Gold Line light-rail cost $1.8 billion. The 18 mile Orange Line BRT cost $506 million to build–considerably less per mile than the light-rail lines. The East San Fernando Valley Transit Corridor project estimated construction costs are coming from the project team. All of the alternatives are 9.2 miles in length. Light-rail is estimate to cost $2.7 billion, tram $1.3 billion, median running BRT $402 million and curbside BRT $294 million. Light-rail is estimated to cost 6.7 times more than the median running BRT. Getting 51% more transit ridership along the Orange Line corridor by installing BRT was certainly not a waste of money if judged by increased service and patronage. There simply would not be any increased level of transit service along this corridor if BRT was not installed. Surface rail was not an option due to the Robbins law. There is no possibility that rail could be built along this corridor in the next ten years. It will take 7 years to get the first Measure R rail project up and running and there is no money currently available, nor is there a rail project on the drawing board to replace the Orange Line BRT. That would be twenty years of no upgrade in transit service along this corridor if BRT was not installed. Twenty-eight thousand people ride the Orange Line on a weekday. Its the second busiest bus line for the LACMTA. That’s hardly a failure or a waste of money. On page 69 of this report it states that the original 14-mile Orange Line in comparison to the approximately same length Gold Line, the Orange Line cost 66 percent less per mile of running way, 71 percent less per hour of revenue service, 59 percent less per annual mile of revenue service, and 64 percent less per average weekday boarding. Page 70 mentions that the fairbox recovery ratio of the Orange Line is 21.2% and the average for the light-rail lines is 17.6%. The state mandate requiring that the LACMTA must build a rail line along the Orange Line corridor is by 2015. No problem, the LACMTA should be able to do that by the end of the year. Yep, no problem at all. That goodness that the Robbins bill was repealed so that the LACMTA can get a rail line installed there by the end of the year. It sure is easy to just come up with a simplistic idea like that. It’s amazing how you can just come up with something that is not true right off of the top of your head. Sixty-foot buses are available with less seats than the Orange Line buses have. Buses in service by the LACMTA in Los Angeles frequently have lots of people standing and these people don’t fall over when the bus is in motion. Recent train car purchases by the LACMTA cost $3.8 million apiece. A 60-foot Orange Line bus cost about $800,000. If a rail car lasts 40 years and a bus needs to be replaced at 12 year intervals, then there needs to be 3.3 buses purchased in the lifespan of a rail car. Using today’s prices those 3.3 buses would cost $2.64 million. Simple math, you should try it sometime. That amount is considerably less than the price of one rail car. The expected lifespan of the light-rail cars for the LACMTA is thirty years. That means there needs to 2.5 60-foot buses purchased in that 30 years. Which would cost $2 million. Which is a little over half the price of a train car over that 30 year time period. Its very doubtful that the LACMTA will keep their rail cars for 40 years. Some of the Blue Line light-rail cars are going to be replaced before they turn 30 years old. Thanks for this article. Just started riding the Orange Line regularly and thought that for a line having its own custom roadway built it sure stopped at a lot of traffic lights and went awfully slow. Glad to find out I’m not crazy and hope the speed improvements come soon. Why can’t they have gates that come down when buses (on the Orange) or trains (on the Expo) approach, like everybody else does? If you’re boarding a bus on the street, they often don’t accept dollar bills. Rail service usually does. It matters. I tried to board a bus in New York not long ago and couldn’t, because I didn’t have 11 quarters. So I had to go to the subway to buy a Metrocard, and took it. I was able to use the Metrocard to come back on the bus, however. If getting on buses and paying was as convenient as rail, and the buses were as punctual as rail instead of coming in threes, people wouldn’t avoid buses so much.